Couture sewing is extremely rewarding, but not something I'm planning on doing again very soon. After many, many hours of muslin making, fitting adjustments, hand sewing, refitting, and many, many hours of hand sewing over 200 inches of fashion fabric and lining; I am finally done. And I'm am pretty satisfied with it! Even Mr. Toad, who at one point said it looked like a hay sack, said he liked it. He did ask if it needed to be ironed, right after I finished ironing it. It is linen after all. 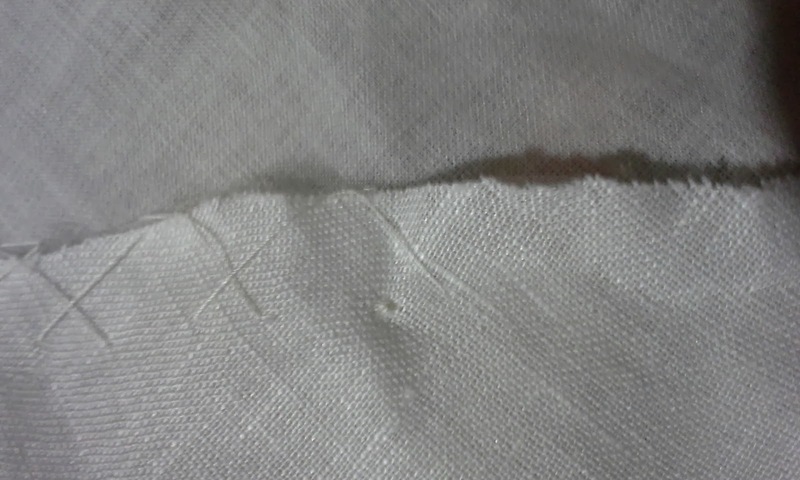 I tried to explain that linen is characterized by the wrinkles. I might have added some in my haste to try it on and get the pictures before some little hands added some hand prints. 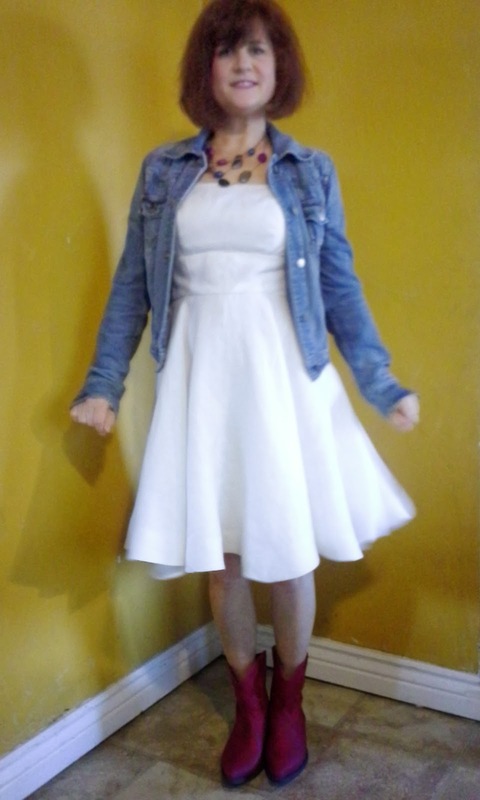 This is the dress I made for the first PatternReview.com contest of the year--The Little White Dress (LWD). The goal is to make a classic styled dress that can be dress-up or dressed-down. It is the summery version of the little black dress. I chose Vogue 8648 because I thought that it met these requirements. It is also the pattern that comes with the Susan Khalje's Craftsy.com, The Couture Dress. I used the techniques in this class. Because of heat in the Sacramento area, I wanted linen. I love linen in the heat. 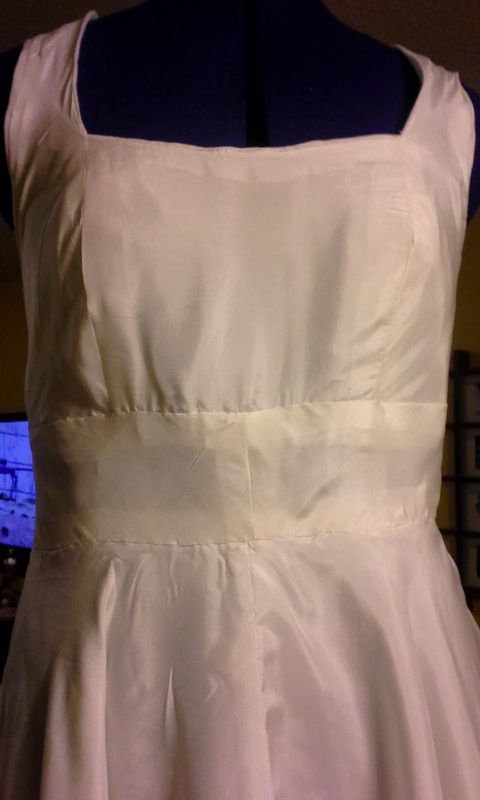 I underlined with silk organza and and lined with habatoi. I wanted something that would be comfortable and breath in the heat. Linen is also a less formal looking fabric which fits my life style. An added bonus is that linen seems to repel dirt more than most fabrics. I bought my fabrics from Dharma Trading Company. I considered buying some dye from them as well, but I think I'm going to keep it white. Yep. I didn't know if I would like the white, but I really do. I really thought it would be dyed another color until I tried it on with accessories. Because I used the techniques in the class, I never even looked at the instructions included in the pattern envelope. The pattern itself was a pretty good fit. However, because this is supposed to be versatile, I raised the neckline and the back. I really loved the squared neckline and repeated it in back. Mr. Toad didn't get any pictures of the back that were focused so I can't show it. I had to make some personal adjustments, raise the front about an inch, the back about 4 1/2 inches, a huge amount out of the back vertically--about 2 inches, then a wedge out for a sway back adjustment about 2 1/2 inches. One thing about the pattern that I might do differently is to combine the midriff panels and make them on grain. The whole dress is on bias, except the front panel and the two back panels. I would also warn that if you make this dress, make sure to hang it for as long as you can-some recommend 48 hours, before hemming. I had to trim up to four inches in areas because of the stretch. I had been putting it on the dress form when I wasn't working on it. 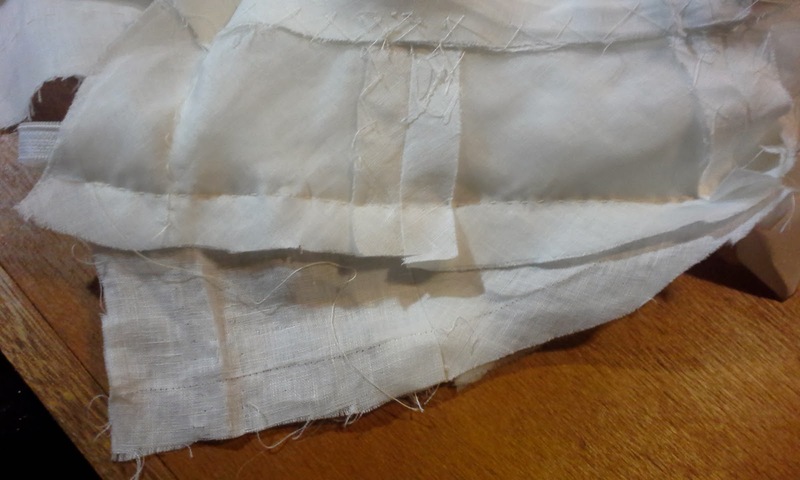 While I enjoyed making this using the couture techniques, there are some areas where I might choose to use the machine--like hemming the lining. I decide to stay true to the whole class and wow, if it weren't for the contest, I think I would have set it down and started another project. I am now very glad I finished. I think this even tops the feeling I had when I finished my first pair of Jalie jeans! The hook, of hook and eye. Now for those who have been following along, the last I left off, I was so upset. But, it turned out to not be so bad. It did add a day of undoing catch stitches, zipper and seams, but the overall result is worth the extra time. And worth not giving up. in place--it is almost as nice as out. I sped through inserting the lining. Well, as much as you can when it is put in piece by piece by hand! I really sat and worked diligently. 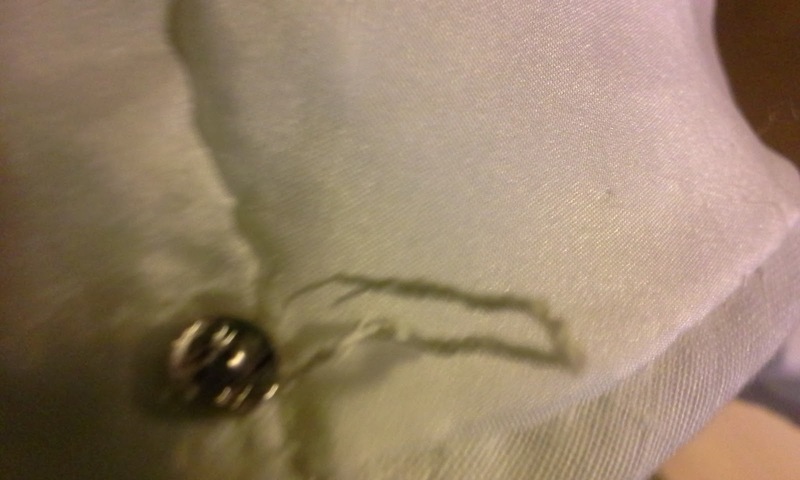 I even went to church with thread on my pant leg. Bra strap carriers. I think all tops should have them. 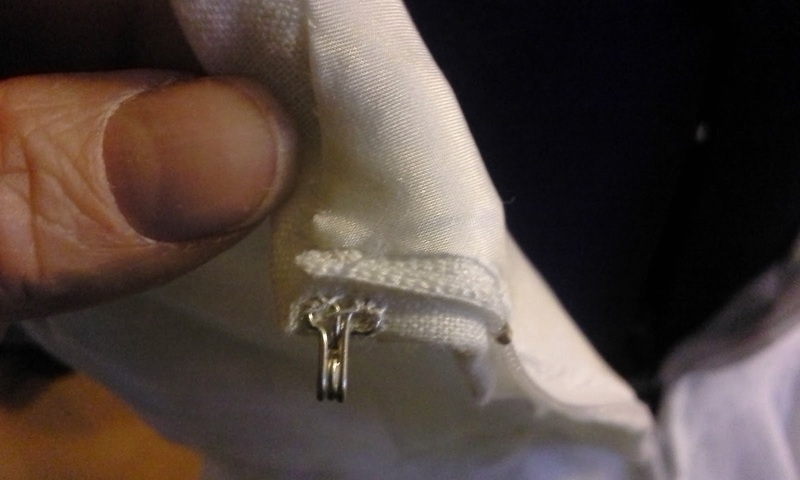 I included, bra strap carriers, hook and eye, hand picked zipper--the coolest, easiest zipper insertion for a dress. While I don't see myself making another of this dress right away, but I do see a silk brocade version in the future. 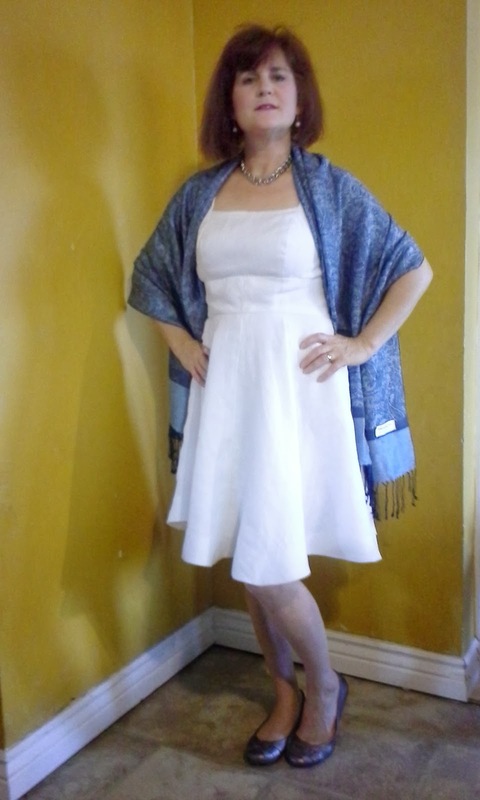 The Little White Dress (LWD) Contest Starts Today! Don't You Hate It When You Think You're Almost Finished? Your dress is lovely!!!!! It is definitely worth all the time and effort you put into it! Good luck in the contest! Thank you. I actually used the contest for inspiration and my timeline. If you look at some of wonderful masterpieces these ladies have created, my dress is just another dress.